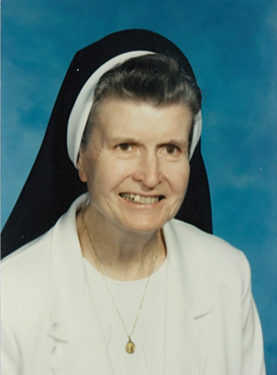 Sister Jean Philip Brady, C.S.J. Sister Jean Philip Brady, C.S.J., a member of the Sisters of St. Joseph, Brentwood, for 76 years, died Oct. 3 at Maria Regina Residence, Brentwood. She grew up in Holy Name of Jesus parish, Windsor Terrace. She attended the parish school and then St. Joseph’s Juniorate, before entering the congregation in 1942 from Holy Name. She earned her bachelor’s degree in theology from St. John’s University, Jamaica, 1955, and a master’s in sacred studies from St. Bonaventure University, 1964. Formerly known as Sister Mary Patricia, her ministries included St. Michael, Brooklyn, 1944-56; St. Brendan, Midwood, 1956-61; Bishop McDonnell H.S., Crown Heights, 1961-66; and Holy Spirit, Borough Park, 1973-76. She served as principal of Epiphany, Williamsburg, 1966-73, and ministered in the neighborhood for over 40 years. In 1976, she began a 33-year ministry at St. Joseph H.S., Downtown Brooklyn, where she taught religion and was a guidance counselor. She volunteered at Queen of the Rosary, Williamsburg, 2010-14, until she retired. A Mass of Christian Burial was celebrated at Maria Regina Chapel. Burial followed in Calvary Cemetery, Brentwood.